It’s a regular love-hate relationship. Shark horror movies, such as Jaws, deep blue sea, 47 meters down, or the shallows, and marine biologists working in shark conservation. As real shark enthusiasts, seeing a film about sharks should be entertaining, however, knowing the damage they do to the conservation of an entire animal group, watching these films is generally bitter sweet. 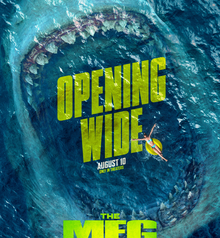 Today is the Dutch premiere of the new Warner Bros movie The Meg, featuring Jason Statham and Ruby Rose. The movie follows a group of scientists who must stop a 75-foot Megalodon shark from terrorizing a beach. A classic combination that portrays sharks as human-eating creatures, as well as upkeep the fairy tale about the survival of Megalodon, a shark that incontestably went extinct over 2 million years ago. Since the release of the popular shark film Jaws in 1975, stories depicting sharks as blood thirsty villains seem to be more popular then ever. Even main Dutch media channels are noticing this trend. I do get the appeal. Like starring a beautiful lead, or having a tearjerking happy ending, evoking a sense of primal fear is a good seller of movies. And sharks still seem to awaken this emotion in many people. Dutch Elasmobranch Society director Irene Kingma was just interviewed about this topic by Metro Netherlands this week, when a post about a starry smoothhound sighting near a beach on Terschelling got several panicky responses on social media. I hoped by now it wouldn’t be necessary to have to reiterate how these science fiction movies cause a negative public perception of sharks, which greatly limits people’s engagement in their conservation. People need to realize that sharks do not eat, nor hunt humans. The amount of annual injuries, and deaths in particular, is greatly exceeded by some of the most common phenomenon such as horse riding accidents, cow tramplings, taking selfies, or mosquito bites. Humans, on the other hand, pose a great threat to sharks, as a quarter of species worldwide are threatened with extinction by overfishing and loss of suitable habitat. More than 100 million of sharks are killed by humans each year. As large predators, sharks are a vital component in marine ecosystems, as they help maintain critical ecological balance. And any diver will tell you how amazing it really is to encounter a shark in the wild. The Meg will surely not be the last movie with a shark antagonist. And we don’t have to take everything so serious, it’s only a movie. I won’t sit here and deny that I’ve seen all 5! Sharknado sequels with great pleasure. But it would be very nice to see a positive message about sharks in blockbuster movies for once, or a story showing the plight of declining shark populations. Maybe that would help people understand why we do our work, and what they can do to help protect and restore populations of these amazing animals.